Public speaking provides an exceptional stage for young people to voice their thoughts and be heard. In accordance with that, UTAR Faculty of Arts and Social Science student L. Sivaraj has been actively participating in many outstanding public speaking competitions in order to utilise the platform to deliver his opinions and knowledge to a wide audience. 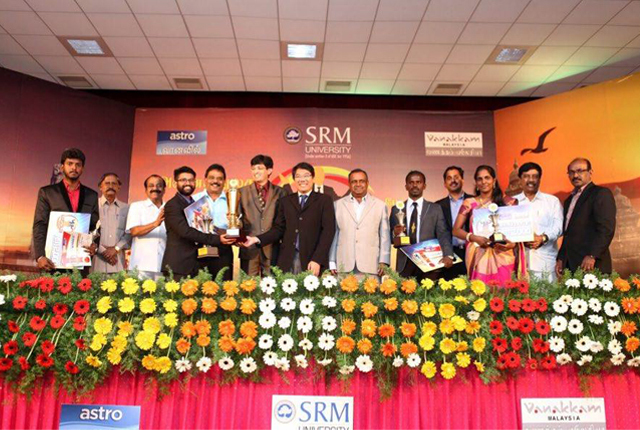 Adding another notch to his belt, the Year Three Journalism student has been crowned the International Champion of the “Pesu Tamizha Pesu” Public Speaking Competition 2016, which was held at the Sri Ramachandra Medical University (SRM) of Chennai, Tamil Nadu in India on 17 December 2016. He beat three other finalists at the International Grand Finale of the “Pesu Tamizha Pesu” Public Speaking Competition 2016. Sivaraj, has received an all-expenses paid trip to India, where he represented the country at the competition. He walked away with a cash prize worth RM5,000, a certificate of achievement as well as a challenge trophy for his speeches on “Love is Mathematics”, “Punishment versus Forgiveness in Deterring Crimes”, and “What would be the best leading fields for Tamilians on a worldwide scale?”. Jointly organised by Vanakkam Malaysia, an Online Tamil News Portal and Astro Vaanavil, a Malaysian South Indian Language entertainment free-to-view commercial satellite channel television network, the one-day competition was aimed to highlight the importance of public speaking as a tool to promote Tamil language and culture. The competition also aimed to promote public speaking skills and to inspire young Indian students to get involved in additional cultural activities conducted by different institutions and organisations. Sivaraj was one of 16 participants who initially competed in the Grand Finale of “Pesu Tamizha Pesu” National Level of Tamil Elocution Contest for students of higher learning institutions 2016, held in SEGi University Kota Damansara in Selangor on 10 September 2016. He was among the three Malaysian finalists that were selected to compete in the International Grand Finale, which saw a total of 16 National finalists from five countries including India, Sri Lanka, Myanmar, Singapore and Malaysia. The international competition started with the primary round where each contestant had to deliver a three to five-minute impromptu speech on a topic given by the organisers. Contestants were assessed on their ability to speak well and present their thoughts relating to the topic clearly and effectively. After each speaker finished their speech, the judges peppered the contestants with two impromptu questions. Their scores were based on the substance, delivery and structure of the speeches, as well as how well they answered the judges’ questions. The competition continued with two more rounds which tested their knowledge and ability to speak, debate and deliver strong justifications for their points. Sivaraj came out on top, beating three other speakers – Suthakaran Balan from Sri Lanka, Saravanan Gopal from India and Kalaiselvi Ratnam from Malaysia. The 10-member judging panel consisted of reputable Tamil professors, nine from India and one from Malaysia. The guest of honour who gave the prizes was Secretary of the Department of Health and Family Welfare, Government of Tamil Nadu Dr J. Radha Krishnan. Also present to witness the ceremony were Consulate General of Malaysia – Chennai Dr Ahmed Bashersham Abdul Jalil, Head of the Department of Tamil Language and Director of Faculty of Science and Humanities of SRM Dr R. Balasubramanian, Secretary of the Department of Tamil Language of SRM Dr Karu Nagarasan, Bharathidasan University Vice Chancellor Prof V.M. Muthu Kumar, Managing Director of Vanakkam Malaysia Thyagarajan Muthusami and Indian Co-ordinator of Astro Vaanavil Dr C. Rajamani.